Agility. Historical analytics requires a certain amount of time to pass in order to derive meaningful conclusions, so it takes longer to see which strategies are beneficial and which are failing. Predictive analytics, in contrast, encourages constant testing and iteration as it doesn’t require as much observation in order to come to a robust conclusion. It gives companies the agility to try new and different methods and quickly determine how effective they will be going forward. Accuracy. The statistical methods used in predictive analytics are built to calculate the probability of their accuracy. This allows decision makers to be informed of the risks of relying on a given prediction, as opposed to historical analytics, where it is more of a subjective call as to how accurate a projection will be. Dealing with Absent Data. 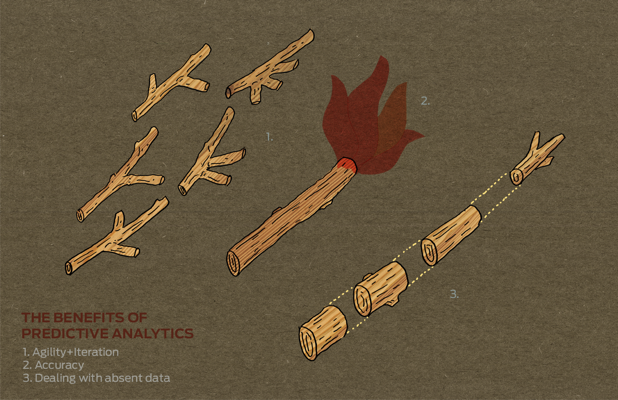 Predictive analytics can be most instructive when there is insufficient historical data – or when the past is not representative of the future. For example, if a retailer is expanding into a new acquisition channel or introducing a new product category, it will not be able to rely on a historical baseline. Predictive analytics would enable it to make decisions even in the absence of past experience. To summarize, predictive analytics and historical analytics both attempt to give an organization insight into what strategies they should pursue going forward. However, predictive analytics enables organizations to adapt more quickly to changing conditions, pinpoint how likely their strategies are to succeed in the future, and make decisions even in the absence of historical data.